Changes in surface heat fluxes affect several climate processes controlling the Mediterranean climate. These include the winter formation of deep waters, which is the primary driver of the Mediterranean Sea overturning circulation. Previous studies that characterize the spatial and temporal variability of surface heat flux anomalies over the basin reveal the existence of two statistically dominant patterns of variability: a monopole of uniform sign and an east–west dipole of opposite signs. In this work, we use the 12 regional climate model ensemble from the EU-FP6 ENSEMBLES project to diagnose the large-scale atmospheric processes that control the variability of heat fluxes over the Mediterranean Sea from interannual to decadal timescales (here defined as timescales > 6 year). 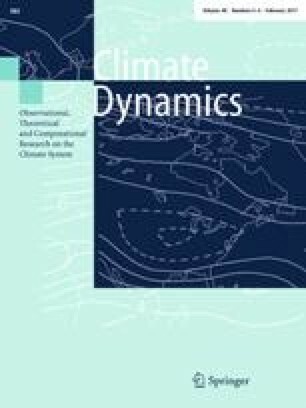 Our findings suggest that while the monopole structure captures variability in the winter-to-winter domain-average net heat flux, the dipole pattern tracks changes in the Mediterranean climate that are connected to the East Atlantic/Western Russia (EA/WR) atmospheric teleconnection pattern. Furthermore, while the monopole exhibits significant differences in the spatial structure across the multi-model ensemble, the dipole pattern is very robust and more clearly identifiable in the anomaly maps of individual years. A heat budget analysis of the dipole pattern reveals that changes in winds associated with the EA/WR pattern exert dominant control through both a direct effect on the latent heat flux (i.e., wind speed) and an indirect effect through specific humidity (e.g., wind advection). A simple reconstruction of the heat flux variability over the deep-water formation regions of the Gulf of Lion and the Aegean Sea reveals that the combination of the monopole and dipole time series explains over 90 % of the heat flux variance in these regions. Given the important role that surface heat flux anomalies play in deep-water formation and the regional climate, improving our knowledge on the dynamics controlling the leading modes of heat flux variability may enhance our predictability of the climate of the Mediterranean area.